The US is to send an additional 2,000 troops to its border with Mexico, the Pentagon has announced. It will bring the total number of troops stationed on the southern border to about 4,300. The Pentagon said the soldiers would help border-patrol agents, carry out surveillance work and install miles of razor wire. It comes as President Donald Trump battles Congress for funds to build a wall along the border. He says such a measure is needed to stop illegal immigration. Mr Trump’s insistence that the lower house of Congress, now controlled by his Democratic opponents, include funds for the wall in the US budget recently led to the longest government shutdown in US history. He struck a temporary deal last month to reopen government departments but has threatened to trigger another shutdown or declare a national emergency if his demands are not met. The current agreement expires on 15 February. Mr Trump is expected to again highlight the issue in his annual State of the Union speech on Tuesday. The US defence department said 3,750 extra soldiers would be sent to the border, although many will replace troops already there. The first deployments took place in November. «Additional units are being deployed for 90 days, and we will continue to evaluate the force composition required to meet the mission to protect and secure the southern border,» a Pentagon statement said. Their tasks will include «a mobile surveillance capability through the end of September 2019, as well as the emplacement of approximately 150 miles of concertina wire between ports of entry». Last Thursday, President Trump tweeted that extra forces were being sent to the border to stop migrants who he said were travelling in «caravans» and threatening an «invasion». Mr Trump has repeatedly described the situation on the Mexican border as a «crisis», although his critics have dismissed the use of troops as a political stunt. Mr Trump is, however, not the first US president to send troops to the border with Mexico. 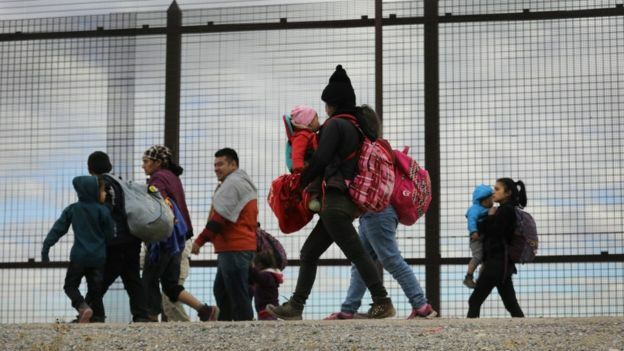 President Barack Obama sent some 1,200 National Guard soldiers to guard the boundary while President George W Bush deployed about 6,000 troops to help Border Patrol agents in what was called Operation Jump Start. Officials in Texas recently revealed that nine migrants on hunger strike at an immigration detention centre were being force-fed. Immigration officials are using plastic nasal tubes to feed some of the men, but relatives say it is causing severe nosebleeds and vomiting. The detainees have refused food in protest against conditions at the El Paso Processing Center. Immigration and Customs Enforcement (ICE) says a federal judge authorised the force-feeding last month.